Watch the video below for more information, click this link to make a donation. Even just one dollar can help, but don’t miss out on exclusive merchandise! HolyRad is a creative studio based out of Brooklyn. It was founded by Daryl Oh, and has been quickly growing since their doors first opened. Since first meeting Daryl Oh at Treble Tuesdays I was in love with her graceful personality and professional demeanor. She has worked behind the scenes, and in the forefront taking on many roles to ensure success, not only for HolyRad, but also those around her. 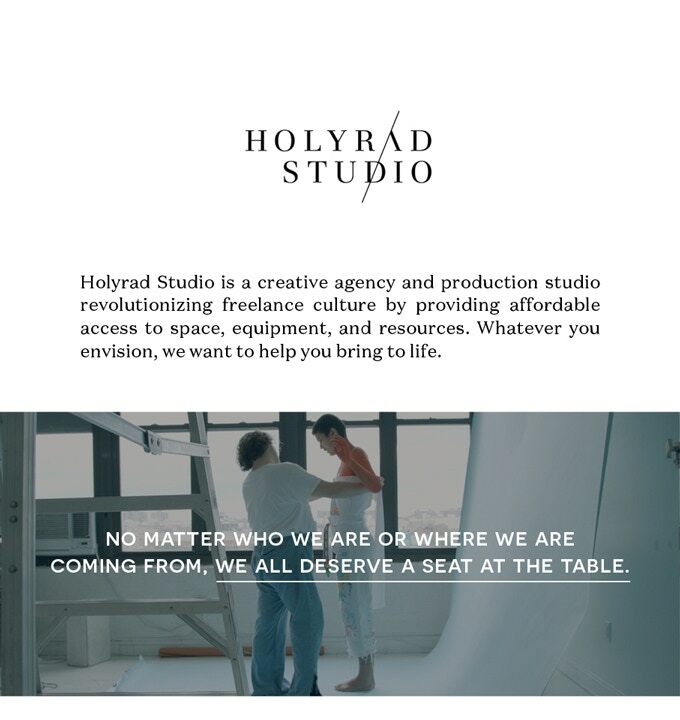 The sustainable climate she has created for her team and members at HolyRad is one we must help grow to maintain affordability in our creative community. HolyRad is working to establish a second location and is asking for us to come together to make it happen. With only 3 days left, we can make a difference and help our allies in the creative world to continue on to the next chapter in their incredible company journey, that works for us and with us! Check out the video below for more information on the campaign. And don’t forget to make a donation! The only way to freeze time is through photography. This is how we hold on to memories; Whether it be performances, objects, people, or events, with a click of the trigger, a frame is captured. Today we’ve selected six photographers with diverse photo techniques for you to find and follow. The eye candy is incredible, but don’t take my word for it, scroll through and find out for yourself. Is there a photographer you love? Share them with us. Today we have so much more to our direct access. We can order something by selecting a couple buttons on our cellphones. Then, ta-da to our doorstep it arrives. The opportunities have since changed since the internet. It wasn’t too long ago when we thought our computers and online searches were here to help us. When the click of a camera would take and image and you had to wait hours to develop. Or rather make art out of it like Warhol. Today, we see hacking feuds taking over top news, and America’s president is only to be found tweeting away at the Oval Office, like Wahlstrom depicts in his “Social Life” series. It’s a common conversation, when in relation to our internet culture. Two Artist - Andy Warhol and Johan Wahlstrom have each showcased their artistic reactions in direction to current politics in the United States. We can date back to 1972’s familiar depiction of Nixon by Warhol, that showcases an example of presidential uproar in the seventies. Wahlstrom, paints his “social life” which, similar to Warhol, also includes social figures influencing society in today’s era. Wahlstrom is also know for his famous photo depicting Trump on his phone while sitting in the Oval Office, which one can assume is him on a twitter rant. To learn more visit the exhibition running all month long. All details below. Opening Reception: September 6, 6 p.m.
1. creative art, especially visual art, whose products are to be appreciated primarily or solely for their imaginative, aesthetic, or intellectual content. "the convergence of popular culture and fine art"
Fine Art is a term used to define classic art forms such as paintings, sculptures, architecture, music, and literature. Although there are other art forms that have been added to the list since, French philosopher, Charles Batteaux gave us the term in the mid 1800's. In today's society we still appreciate the history and classics left behind by the greats, but have also found ways to alter, enhance, and define new forms of art that are still influenced by the old school. For our #TheOtherSideOfTheBorder series we will be bringing attention to Architecture, Sculpture, Painting, Music, and Literature that comes out of Mexico. Does your culture exude its own genre of fine art? Share with us. There is no better weekend for a Hamptons visit than this one! Independence weekend, and art fair in perfect harmony for many to enjoy. The weather has been nothing but clear skies and sunshine it's as if we've been kissed by Mother Nature for working so hard on keeping it clean. The skies were a little cloudy late in the evening, and in perfect need to water the potato farm that lived directly behind the art fair. Upon arrival we were accompanied by many curious art aficionados who were on a hunt to find a new addition to their home. Among the curious art collector there were curators, gallerist, and artist present to talk about the work that decorated the walls. A few standouts were Frank Currie, This Is Addictive, Margaret Bowland, and Hijack. Each artist depicted a current topic in relation to today’s society while still showcasing tasteful creativity. Ever walk around the city and wonder who? what? where? why? when? These are all questions designers ask themselves everyday. What is design ? SO MANY QUESTIONS BUT WHERE ARE THE ANSWERS?? Design is anything and everything around us. It is the bench you sit in on the subway, the lights that guide your path, and the reason paintings provoke emotions. Design week opens up the doors into the world of appreciating the process. NYCxDESIGN is an annual event that celebrates NYC as a city of makers, dreamers, and motivators, it attracts people from all over the world. There is so much to do during design week that no matter what world you come from you will find something to enjoy. I had the pleasure to attend a few events this time around and if you missed it check out this article, and prepare yourself for next year because the aesthetic overload is worth being a part of. As a professional designer I am obsessed in learning the mechanics of a product. I want to know everything about its construction. ICFF is a design convention where all the answers exist. ICFF is held at one of the most iconic buildings in New York City - The Jacob Javits Center, in Hells Kitchen. 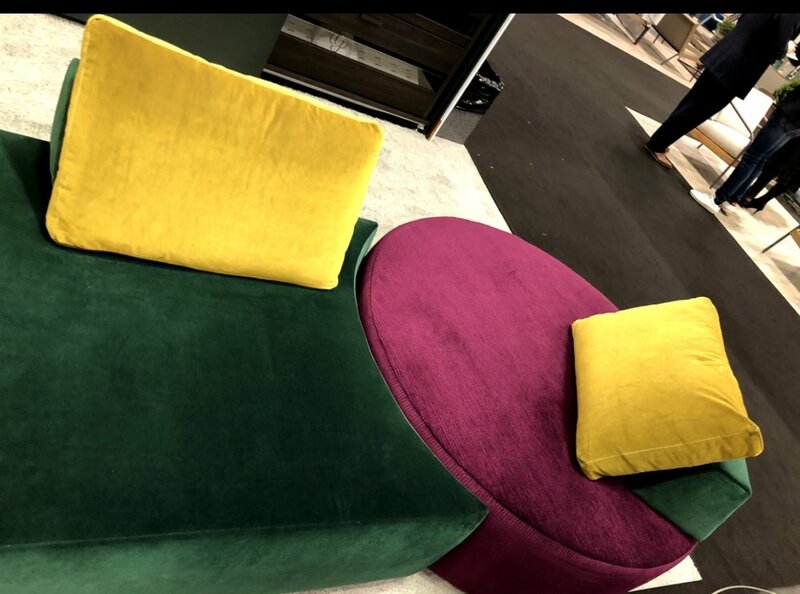 One of the first booths I was drawn to was because it was filled with a series furniture pieces that were different is size and texture, but all one color. Opening Ceremony X Crosby Studios, collaborated for ICFF to design a world of purple. It was a booth for awakening the senses. Let the feelings of touch takeover while you sink into a fuzzy chair. Switch on a lamp whose silhouette could give you a high five! The color purple allows you to look at all pieces as one, forcing your curiosity to come alive. Then I ask, why is it different? The best part is, you are allowed to touch everything! Inspiration is limitless, and you end up imagining things you didn't even know you needed. Wanted Design is the baby of the ICFF design fair. It's only been around four years but has impacted the design world at a rapid rate. Here, New york city celebrates design globally. I met a furniture designer from Mexico who shared the same fabrication struggles with me. He heard me complaining about lack of space and and told me to find space. I met Victor Alvaro, the direction and furniture designer of “Victor Alvaro Studio”. After sharing tips and tricks we’ve both learned on our journey through the design process, he became a friend and a mentor. Within a few minutes I was inspired. I was invited to the studio in Mexico! Which was a pleasant reminder of the networking opportunities NYCxDESIGN can provide, while allowing you to gain new understanding of the world. Wanted design also hosts a series of talks about sustainable and charitable design. Reminding us the importance of purpose in design within our everyday life. Even though Design week only occurs annually you can find events like these all year round and throughout the city. Design is all around us. To check out galleries, film events, trade shows and more just take a walk around any of the 5 boroughs and be inspired by today and tomorrow. Brooklyn born and bred, Jamila J. Brown has always had a passion for telling stories, watch Go Fish! A story about two young girls from different walks of life that meet over a game of go fish and become friends shortly after the Crown Heights riot of 1991. Wellness Wednesday: Poetry Month and Dr. Maya Angelou's 90th Birthday! There are a couple things I like to do when I am feeling down. One of them requires me to feed my demons and but the other works to uplift my soul. I prefer the latter, and that consists of reading motivational words of wisdom or listening to speeches by great leaders who have impacted greatness in the world. In honor of Dr. Maya Angelou's 90th Birthday, I am happy to remind us all that we have the ability to celebrate each day we wake up. Angelou's life was not an easy one but she was able to accomplish many firsts that people thought were unimaginable in her time. Watch the video below and read her poem, "I will rise" or watch here. May these words uplift your spirits to allow you to have a day full of infinite productivity in whatever endeavor you may find yourself. Awards Council member and the Banquet moderator Oprah Winfrey presents the American Academy of Achievement’s Golden Plate Award to Maya Angelou during 1990 Achievement Summit in Chicago, Illinois. Johan Wahlstrom is one of the finer artist of our generation, with ranging talents in music to painting. Composing, touring with the greats of Rock & Roll classics, and in more recent months exhibiting alongside Picasso in Europe - Johan's diverse CV allows for great art inspiration. Dirt Cobain: "I am an artist. I am a creative, I strive to be original and focus on my own style. I do my own thing, and always try to keep moving forward." SOYYO: When did you begin art? Was is always graffiti? Dirt Cobain: I’ve been drawing forever. Ever since I was a little kid. It’s always been something that I’ve done... as far as street art and graffiti goes, I started out just tagging as a kid. It was always a rush for me. And I just grew from there. Always trying to do something bigger and better. SOYYO: What is the meaning behind "U get me so high"? Dirt Cobain: The meaning behind “u get my so high” is that is a metaphor for anything that you can’t stop doing. Or anything that you always go back to. Anything that gives you a high. Whether of it’s art, love or music. It could be anything. I want people to create their own interpretation of it. I want it to make people think when they look at it. That's what art should do. It should make you think. SOYYO: Are there other artists that inspire your work? SOYYO: Where did the name Dirt Cobain come from? Dirt Cobain: My nickname as a kid was “dirty d” so I’ve always had that name. And Dirt Cobain is pretty much stemmed from that. It’s kinda like my rock star nickname for myself!! And, the obvious pun of the name Kurt Cobain is kinda like a representation of the era in which I grew up. It’s my way of giving a shout out or paying respect to the mid 90's. SOYYO: How has your sobriety impacted your artistic evolution? SOYYO: How do you want individuals to feel when they see your art? Dirt Cobain: I want people to feel something. What ever that may be. I just want them to feel some type of emotion when they look at my art. I want them to come up with their own interpretation of it. whether it makes them laugh, happy or even if they don’t like it. SOYYO: Name the high and low points of your career thus far. SOYYO: If you could paint somewhere in the world you have not yet gotten to, where would it be? Tune in next week for exclusive video interview With dirt cobain! In recent years, the push for inclusivity in mainstream media has become more popular than ever before. From television to marketing campaigns, consumers demand diversity and brands are finally listening! But this isn't a new concept. Progressive activist groups, like the "Guerrilla Girls", existed long before audiences pressured companies into embracing different races and genders. With the use of witty humor and thought-provoking facts, feminist activist group, "Guerrilla Girls" have used artwork and speaking engagements to expose sexism and racism in the political, media and art worlds. Their work consists mostly of statistics and words and less of imagery and illustrations. They support a "guerrilla" approach by using art to taking on prevalent organizations. The group’s art is part of the Whitney Museum’s 'An Incomplete History of Protest' exhibit. Most of the pieces, on display now, were created in the late eighties to mid-nineties. In the art piece, "Guerrilla Girls' Definition of a Hypocrite", the girls call out the left winged art world by defining a hypocrite as, “An art collector who buys white male art at benefits for liberal causes but never buys art by women or artists of color.” The other works highlight people and media outlets that lacked support for women and minorities; such as, Andy Warhol in "How many works by women artists were in the Andy Warhol and Tremaine actions at Sotheby's?" (The answer is 0), Art Flash Magazine as the art magazine that showed little to no female artists in 1988, and the Reagan-Bush administrations for their lack of support for people of color in "How long did it take to loot South Central L.A.?" While the guerrilla mask wearing activist group has existed for decades their message continues to remain on brand. The piece titled, How many women had one-person exhibitions at NYC museums last year?, exposes the Guggenheim, MET, and even The Whitney for not having any female-led exhibits up until the year 1985, is noticeably not on display. One of their pieces created in 2012, called Gender reassignment, shames the Art Institute for only having female artists showcased in 10% of their modern galleries and 18% of their contemporary galleries. The 17 piece collection, created over a quarter of a century ago, feels as if it was designed this year. Their current collection sadly embodies the idea that the more things change, the more they stay the same. Have you seen the Guerrilla Girls' self-titled exhibit at the Whitney Museum yet? Let us know what you think in the comments below. For years 7575 Melrose has been the place to stop and snag a flick with your favorite art vandals. Just recently, the art wall was given a facelift and it's looking a lot brighter. The old 7575 Melrose art wall was covered in wheat paste art, some graffiti and it was looking a bit worn down. Dirt Cobain invited SOYYO Magazine to capture the new work of art in action. We had the pleasure of meeting Vyrus, Angel Once, Goop Massta, Bam One, Adam Dare and Dirt Cobain himself. Check out the images of each artist's works, and tune in 3/13 for an exclusive interview with Dirt Cobain as we catch up in LA. It's been quite a year of breakthrough, so many have come to stand side by side and be a part of a more inclusive society. This week, Kehinde Wiley's Portrait of POTUS 44 - Barack Obama - was revealed and the whole world had something to say, including us! On February 13th, America discovered Kehinde Wiley - a New York-based artist born in Los Angeles, California. Wiley's impressive resume begins at the young age of 12, when he attended art school in Russia, then in 2001 he moved on to master the Fine Arts at Yale University. 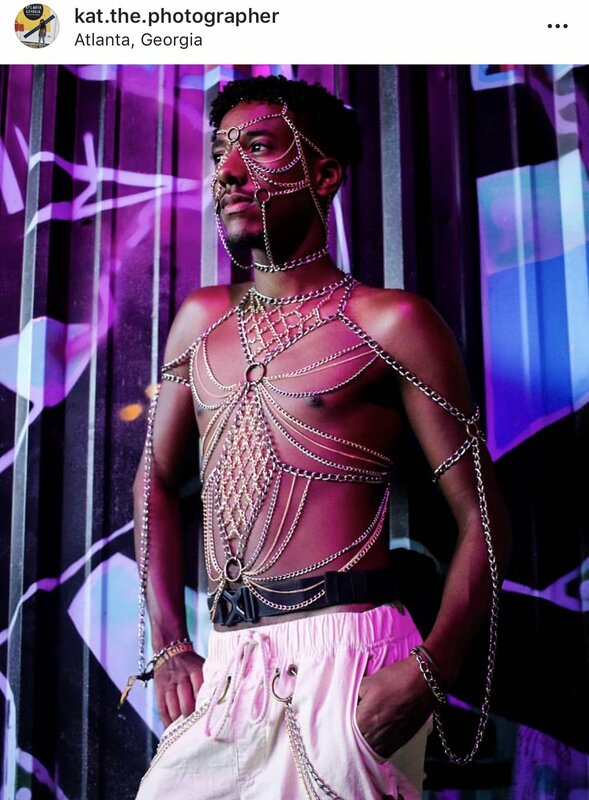 Since his graduation, Wiley exhibited his work in Museum of Contemporary Art (Los Angeles), Museum of Fine Arts (Boston), to the Brooklyn Museum of Art - just to name a few. By painting Obama for the prestigious Smithsonian NPG, Wiley has made history. His distinct ability to capture current culture while keeping a lively element to his paintings makes every portrait instantly recognizable. His unique style brings a provocative yet tasteful element to the finished painting. Kehinde Wiley implements symbols to his portraits that have underlying significance to his subjects. Check out Obama's photo below, guess what kind of flowers are painted, and what they symboliz for a chance to win a FREE lifetime subscription to SOYYO Magazine. Every year, on the first week of December the best artist, top galleries, and most eager collectors meet in Miami, Florida for Art Basel. People from all over the world come together to find new contemporary or modern works to bring into their homes. With over two hundred galleries, daily of pop up events, and thousands of peoples due to fly in - we will have plenty of stories to share with you! Take a look at some images from last year, and check back with us on 12/14 for updated content! With less than 20 privately owned Da Vinci’s in the world, it is no surprise that “Salvatore Mundi” was sold at a record-breaking, $450,312,500 at a Christie’s auction last week. The 600-year-old Da Vinci is the talk of the art scene at the moment, with such a prominent history and hefty price tag, it is rightfully so. The painting is believed to have been created around the same time as the Mona Lisa. The painting is a depiction of Jesus Christ holding a crystal orb while holding a blessing gesture to whoever is observing the painting. In the early 18th century Salvatore Mundi was lost and later resurfaced in the 20th century to be sold at a Christie's auction for only $60, circa 1958. There was skepticism about the authenticity of the painting and was believed to be a copy. The current owner of the Da Vinci is unknown, but the former collector, Dmitry Rybolovlev isn't losing sleep over it. Protect Yo HeArt's UncuttArt releases a podcast! If you live in New York, or have ever visited the city that never sleeps then you have surely seen “Protect Yo HeArt” stenciled on streets. UncuttArt came up with the quote, "Protect Yo HeArt" which has now evolved into a movement that reminds you to protect your energy and pursue self-love. Just recently I had the pleasure of meeting the anonymous artist, who is more formally known as Uncasso. Uncasso honored me with an invitation to his recording of a new podcast, that is being released monthly. On a calm Sunday Afternoon, I made my way over to the Anthony, a newer venue for the creative night crawlers of NYC. Upon walking up to the door I was greeted by familiar faces who were taking in some fresh air before going back to the club filled with art, conversation, food and drinks to enjoy. Yayoi Kusama's "Festival of Life" NOW EXHIBITING! The David Zwirner Gallery has a total of four locations worldwide and we are fortunate to have three of four, here in New York City. Now, until December 16, 2017, the David Zwirner Gallery will be showcasing "Festival of Life" by Yayoi Kusama at 525 and 533 West 19th Street in Chelsea. Her work depicts minimalism and pop art. Yayoi Kusama has been working with the David Zwirner Gallery since 2013, but has been immersed in the New York art scene since the early 60s. Her popularity and artistic impact is still saught after regularly, therefore a gallery visit is usually one you have to plan for. To learn more about visiting the exhibition read more here. In 1977, The New Museum opened its doors to New York City. Thanks to, Marcia Tucker, once a curator at the Whitney Museum of American Art, who wanted to bring attention to contemporary art on a museum platform. Today you can find exhibitions curated by a floor that begins at ground level and takes you up 7 levels and brings you back down to the basement level where you will find more work by artist worldwide. With the peak of winter making outdoor activities a drag, the best thing about Museums is their ability to take you on a journey from someone else's perspective while staying cozy indoors. Visit the exhibitions now before they disappear early January. October 14, 2017, was the opening of Daniel Arsham's Angle of Repose, at Perrotin Gallery in Paris. It was a beautiful autumn night my friend, Chayana, and I made our way down the cobblestone sidewalks towards, 76 Rue de Turenne. Upon our arrival, we were greeted by the gatekeeper, whom we said our hellos to and continued on to the courtyard and up the steps into Perrotin Galerie.